But before we jump to conclusions, let’s zoom out to get the full picture. 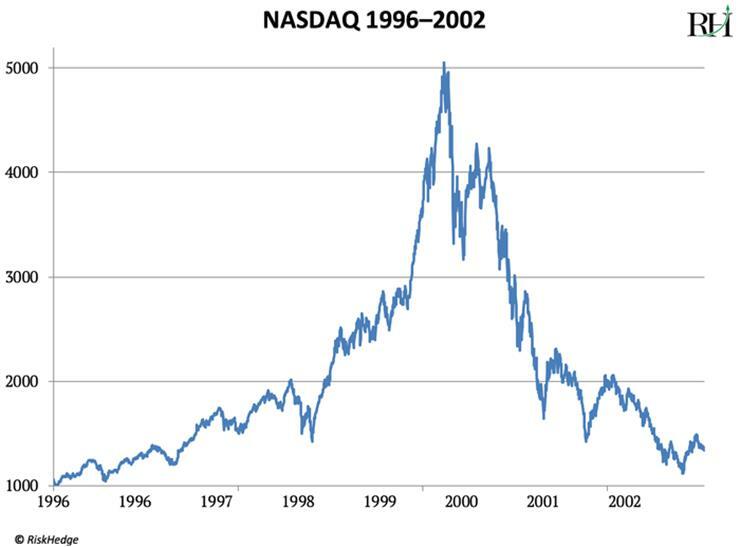 Here’s a Nasdaq chart from 1996 through today. Most folks remember the dot-com bubble for the irrational excitement… and for the millions that poured into silly internet companies like Pets.com. They were supposed to “change the world” and make investors rich. But the thing is… the internet really did change the world. Many internet stocks really did make investors rich. And as I recently explained in the RiskHedge Report, they will continue doing so. Do you know that the largest, most powerful companies on earth today are tech firms? Apple, Amazon, Google, Microsoft, Facebook, and Chinese tech giant Tencent are six of the seven biggest publicly traded companies on the planet. Some of these stocks weren’t around during the Nasdaq bubble. But had you bought one that was around in the aftermath of the crash, you would’ve made so much money that the gains are almost impossible to believe. Had you bought Apple after the bust (around 2001–2004) and held your shares until today, you’d be sitting on a 20,000%+ gain right now. Amazon would’ve handed you a 30,000%+ gain. It would’ve been really, really hard to hold these stocks through their big ups and downs over the last 15 years. But if you managed to do it, your $5,000 investment could’ve ballooned into $1.5 million. It’s important to understand that the late ‘90s Nasdaq runup was not unusual. It followed a script that disruptive stocks follow over and over and over again. Keep in mind, disruptive companies literally invent the future. Amazon created the online marketplace. Netflix pioneered video streaming. Apple is the reason 85% of Americans have a smartphone. Because these companies set out to accomplish things that have never been done before, disruptive stocks are prone to hype and wild exaggeration. Investors get carried away with dreams of riches. Their imaginations run wild, and they bid disruptive stocks up to the moon. This often happens when a new technology is immature and not ready for “prime time.” Reality eventually sets in, the sector crashes, and overeager investors get wiped out. Remember the Super-Bowl Level Hype in 3D Printing Stocks Around Six Years Ago? Promoters claimed that every American would soon have a 3D printer in his house, just like we have paper printers today. These magical devices would “print” anything we wanted, on demand. Investors ate it up and plowed billions into 3D printing stocks. 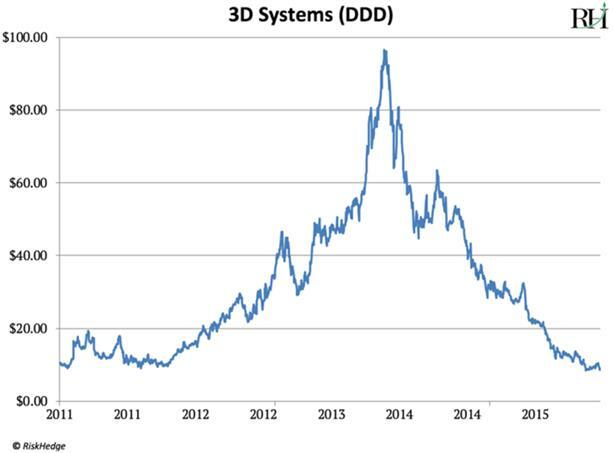 3D Systems (DDD), the largest 3D printing company, exploded to a 900% gain in two years. 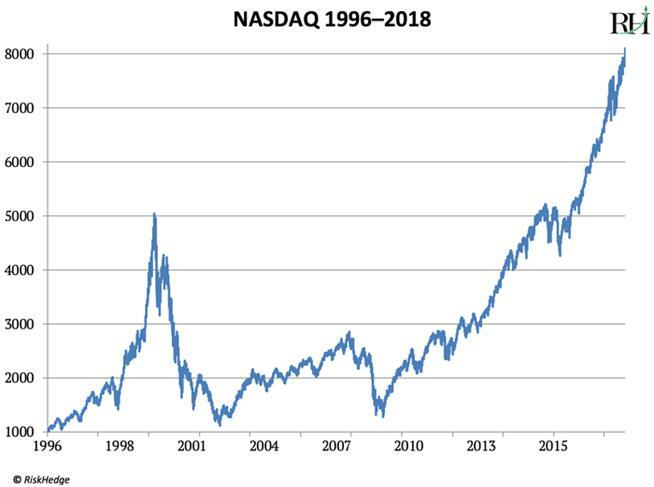 Looks a lot like the Nasdaq from 1996–2000, right? That’s because this particular vision of 3D printing was a gimmick. But 3D printing itself is no gimmick. Set aside the fantasy about a 3D printer in every household, and you’ll realize the technology really is revolutionary. Unlike when promoters were fawning over 3D printing in 2014, some of the world’s largest companies use it today. Airbus (EADSY), one of the two biggest plane makers, is 3D printing thousands of parts for its planes. Management says it is around 50% cheaper to 3D print these parts than to manufacture them the conventional way. Rival Boeing (BA) 3D prints over 50,000 parts for its planes. Management says it saves $3 million per 787 Dreamliner because these parts are cheaper to make this way. Here’s the key to understanding why 3D printing is so important. Conventional manufacturing usually involves stamping, molding, or carving away existing material to create what you want. 3D printing, on the other hand, starts from nothing and layers on material to create an object from scratch. For this reason, 3D-printed parts are often lighter, more efficient, less expensive, and more precise than anything humans could create before. Take jet engine maker GE (GE), for example. It has replaced more than 850 parts of a normal aircraft engine with only 12 3D-printed components. This reduced the engine’s weight by 5%, which saves 20% on fuel costs. The average airline spends 25% of its expenses on fuel, so you can imagine how huge a deal this is. Leading research firm Wohlers Associates found the 3D printing market grew to $7.33 billion last year, which is a near doubling from 2014. Yet 3D printing stocks remain 80% below their 2014 highs. Boston Consulting Group estimates 3D printing will explode to $15 billion by 2020, which is in line with my estimates. I think buying the right 3D printing stocks now is like buying Microsoft or Apple in 2002. Stratasys (SSYS) is one of the largest and oldest companies in the 3D printing space. It has over 18,000 customers around the world including Airbus, Boeing, Lockheed Martin (LMT), NASA, Ford (F), and Volvo (VLVLY). I like SSYS best for two reasons. One, it holds a 25% market share in industrial 3D printing. Its main competitor 3D Systems (DDD) only has an 8% market share. Two, SSYS is on sale. Its price-to-book (P/B) ratio is just 1.2. You rarely see stocks with such huge growth potential trading for such a low price. DDD’s P/B ratio is 4. SSYS had been stuck in a crushing bear market for most of the last four years. This year, its stock has climbed 27%. I think it has broken out of its downtrend, and I expect it to climb much higher in the next 12–18 months.